You’ll enjoy cleaner, healthier, protected carpets with our Commercial Carpet Cleaning service. We’re local Sheffield based experts at providing Commercial Carpet Cleaning and can restore your commercial carpets to an almost new state. This extends the life of your carpets and eliminates the need to order replacements. 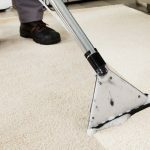 We can provide bespoke carpet cleaning and maintenance services in Sheffield & the surrounding area to help you keep your carpets looking pristine. Welcome clients and visitors to your premises with pride. and save money by extending the life of your carpets. Protect your staff with a healthier working environment. All work is done to the British Standards PAS86:2008 “Professional inspection, maintenance, cleaning and restoration of textile floor coverings – Code of Practice” for your Peace of Mind. You’ve probably walked on carpets we maintain. If you queue in a high street bank, relax in a restaurant or shop in the Sheffield area, there is a good chance that the carpets under your feet will have been cleaned by me or my team members at some point. Hotels, shops, office blocks, residential homes and hospitals are other locations that are regularly cleaned by us. We understand that you want minimal disruption, so we offer evening and weekend appointments to suit your schedules. Our process allows our professionally trained commercial carpet cleaning team to clean carpets and ensure most are dry in 1-2 hours. 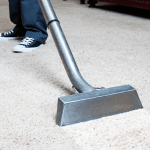 This minimal disruption becomes really important when you consider that alternative carpet cleaning methods can take up to two days to dry completely. That’s two days of trampling dirt back onto the carpet, and a potential Health & Safety nightmare if you have any vinyl floors in the area. Carpets cleaned using our unique solutions stay clean longer too. We don’t rely on cheap harsh detergents to do the cleaning, so there is no sticky dirt attracting residue left behind, so carpets stay cleaner longer. By not relying on sheer volume of hot water rinse and extraction we’re typically we’re using less water than a conventional method. This virtually eliminates the risk of overwetting and shrinkage. We’re not general cleaners who clean carpets. All we do is clean carpets and soft furnishings, so you won’t get someone who was cleaning windows yesterday cleaning your carpets today. All our technicians are trained to the highest standards in our industry. We all live locally and take a personal pride in doing a great job. We want to earn your continued business and all our work is backed by our No Quibble guarantee – If you’re not completely delighted with the workmanship and service, and we can’t correct it, we’ll not charge you – No Quibble. Call to discuss your requirements with our commercial specialist, Allan Simmons Jr.